I had this big long post planned but I am short on time today so maybe tomorrow I will fill in some blanks. In the meantime I figured I would share a darn tasty made-from-scratch vegan soup I made within the last week. It's is a Creamy Vegan Potato Soup. It turned out SUPER YUMMY and I really want to have a big bowl of it again soon! All in a high speed blender. Because I used the red potatoes it looks like specks of bacon - paired with the black sea salt - it just might 'fool' non vegans. It looks delicious. I'm out of Himalayan Sea Salt; however, I reordered a few days ago. It should be here within a few days. I also ordered 10 pounds of golden flax seeds. My daughter likes eating them plain and I do use them in my raw dehydrated snacks. They should last me for a while. I still have quite bit of flax seeds in my stash, too! And because I only useless than a pinch of sea salt at a time I won't need any for...YEARS...lol...ok...maybe NOT years...but a long time! It does last a while, mine (two pounds) lasted for a year. I did give my BF half for his house. This looks so delicious! Super thick and creamy, YUM!!! Let me know when/if you try it! This looks wonderful, perfect for a hearty vegan soup. Thanks! It was very filling!!!!! I really liked it! Can't wait to try it again! So yummy! This is my kind of healthy comfort food! 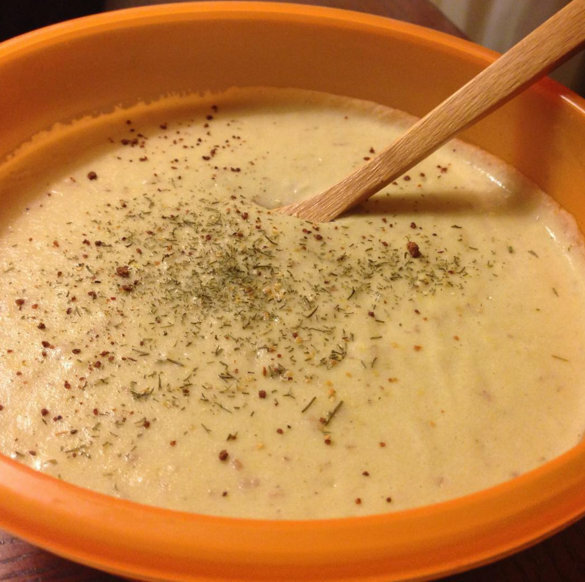 Thank you for sharing your healthy and delectable Creamy Vegan Potato Soup recipe with us on the Plant-Based Potluck Party Link Up. I'm pinning and sharing. Comfort Food - for sure! I can't wait to try it again! I've been craving it! I'd love to try this. Love hot soups with toasted baguette slices. This sounds super delicious! I bet it would be good on rice and veggies. Or even a good dipping sauce. Yum! It could certainly have a hummus like consistency if you use less liquid :) A dip would be good...didn't even think of that!